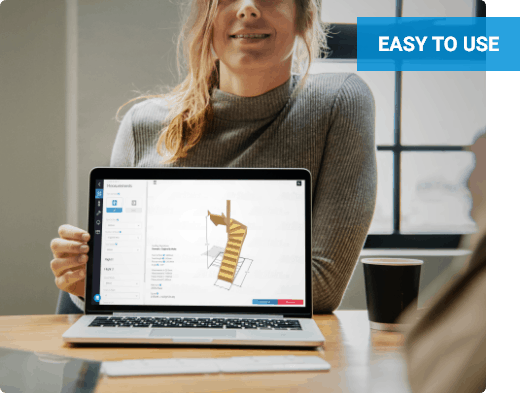 It is now easier than ever to design and build the perfect staircase for your residential or commercial premises, thanks to our innovative and easy-to-use 3D stair builder tool. Design and build the perfect staircase with our online tool and we’ll convert your idea into a real staircase and have it delivered to your door! Mr. Stairs is a technology-driven family-owned business with more than 50 years of carpentry experience. 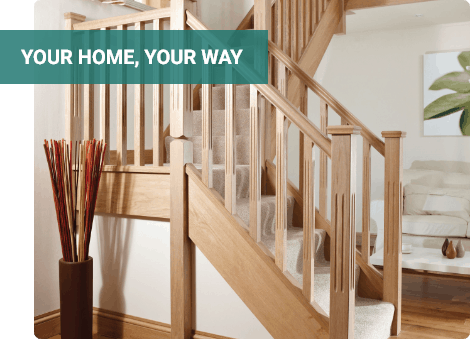 As one of the leading timber staircase manufacturers in the UK, we provide our customers with high-quality stairs products and stair parts at the best prices. Our company is run by a family of master carpenters who ensure that every project we undertake gets the attention it deserves. We supply stairs for private homes and even produce multiple units for house builders. Do you have a specific staircase idea you want customized to suit your home or workplace? Use our stair builder tool to design it online or talk to our expert craftspeople right now. You can design stairs of any style from classic wooden to elegant modern designs. Our highly qualified and experienced technicians provide you with a perfect combination of classic joinery techniques and modern technology to manufacture custom made-to-order staircases. Everything is built on our on-site workshop and delivered straight to your doorstep ready for installation. To ensure every staircase meets our strict quality control standards, we fully preassemble and disassemble every staircase before shipment. At Mr. Stairs, we not only provide high-quality workmanship but also deliver your staircase promptly on time. Place your order today and your staircase, made exactly to your specifications, will be delivered in 7 to 10 working days. Whether you opt for a pine staircase or a solid oak staircase, rest assured we have got you covered. Our stair builder tool is extremely easy to use. It allows you to design your dream stairs online from a wide range of available styles. You can even live adjust floor height and staircase measurement directly on your design. You get accurate views of your design from all angles by zooming, panning, and rotating the stair model. Go ahead and try out different materials and finishes to see what your end product will look like – such as pine, solid oak or dark red hardwood. Use our add-on pricing module to know how much the stair will cost before you even place your order. Why Build Your Staircase at Mr. Stairs? At Mr. Stairs, we only use materials from renewable and sustainable sources to build our products. If you need help with your design, talk to us and we’ll gladly help. We are with you from start to finish. We make sure that your project runs smoothly. Our unique shipping style ensures that your staircase is delivered on time without delays. If you need more information, clarification, or help using our online stair builder tool, just call us or drop us an email and we’ll respond as fast as possible. We have a friendly customer support team waiting to answer all your questions and concerns. UK’s #1 staircase manufacturer. We use the latest technology to bring you the finest and highest quality products. Staircase no longer have to be complicated, let Mr Stairs guide you and help you find the best solution for your money.